At 10:35am PST this morning, I sent in my wing kit order. Given the 13 week lead time, it should arrive sometime in…(counting)…August. I think I can keep busy for a couple months. Later Friday night, I heard back from Barb. method other than by my normal freight company. Thanks for the order. 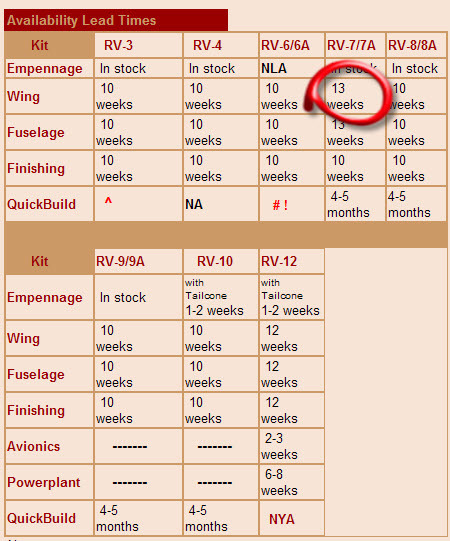 Andrew, it will cost about $359 to ship the wing kit to your door by ABF. Now I need to contact Tony Partain to get an estimate through him. Apparently, if you order the deluxe locking fuel caps, Van’s will credit you for the caps they normally send with the kit. That turns $210 deluxe locking fuel caps into $150 deluxe locking fuel caps. Wuhoo! This entry was posted on Friday, May 14th, 2010 at 10:54 am and is filed under Wings. You can follow any responses to this entry through the RSS 2.0 feed. You can leave a response, or trackback from your own site.